The Pentacam® is a combined device consisting of a slit illumination system and a Scheimpflug camera, which rotates together around the eye. A thin layer within the eye is illuminated through the slit. Because they are not entirely transparent, the cells scatter the slit’s light. In doing so they create a sectional image which is then photographed in a side view by a camera. 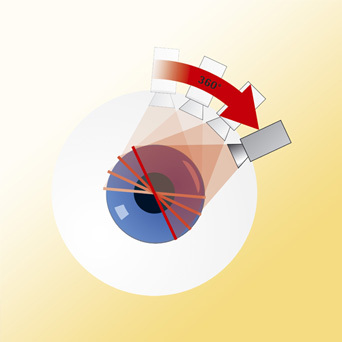 This camera is oriented according to the Scheimpflug principle, thus creating an image of the illuminated plane which appears absolutely sharp from the anterior surface of the cornea right up to the posterior surface of the crystalline lens (if the pupil is dilated wide enough). Rotating around the eye, the slit-camera device generates a series of radially oriented images of the anterior eye chamber. In the subsequent analysis of the sectional images, tissue boundaries are detected and point clouds are assigned to the various tissue layers (anterior and posterior corneal surfaces, iris, crystalline lens). The Pentacam® is one of the few instruments on the market able to perform a precise and complete measurement and analysis of the center of the cornea. The rotating measurement principle assures a large coverage of the corneal surface and a minimization of the nose shadow. Due to the radial orientation of the sectional images, the density of data points is greatest at the center. This contact free, hygienic measurement process takes less than two seconds. This is the time it takes to generate 50 sectional images yielding in turn 138,000 distinct elevation values (Pentacam® HR). OCULUS has now implemented a DICOM interface for the Pentacam®. DICOM (Digital Imaging and Communications in Medicine) is a standard defining file formats for storage of medical data. It also provides a communications protocol for the exchange of this data. In this way it ensures the safe and easy transfer of Pentacam® image files. 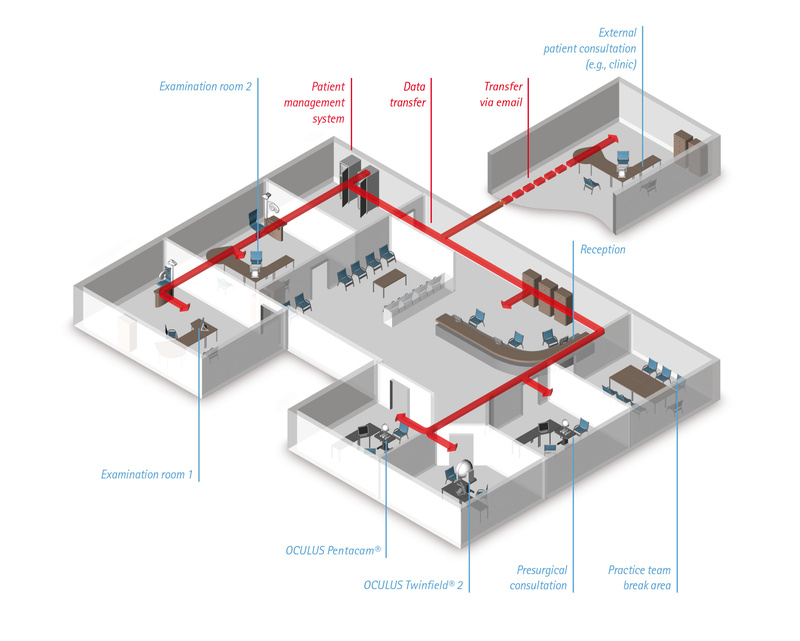 Moreover, with an additional software module for the OCULUS patient data management system, the Pentacam® can be fully integrated into the DICOM environment. The patient data management system receives the information about the patient and the examination needed using the DICOM Modality Work List and forwards this information to the Pentacam®. The examination data from the measurements is transmitted to the Picture Archiving and Communication Systems (PACS) as image files. All DICOM viewing stations with access to the PACS, can retrieve the stored data for any patient. Network solutions save you time and improve the efficiency of your daily work – we will be pleased to assist you! OKULIX is an IOL power calculation software developed by Dr. Paul-Rolf Preussner which can be linked to the OCULUS Pentacam®. It automatically imports the anterior and posterior corneal curvature data over from 360 meridians calculated by the Pentacam® software. The software contains a huge and expandable database with IOLs from all major manufacturers. 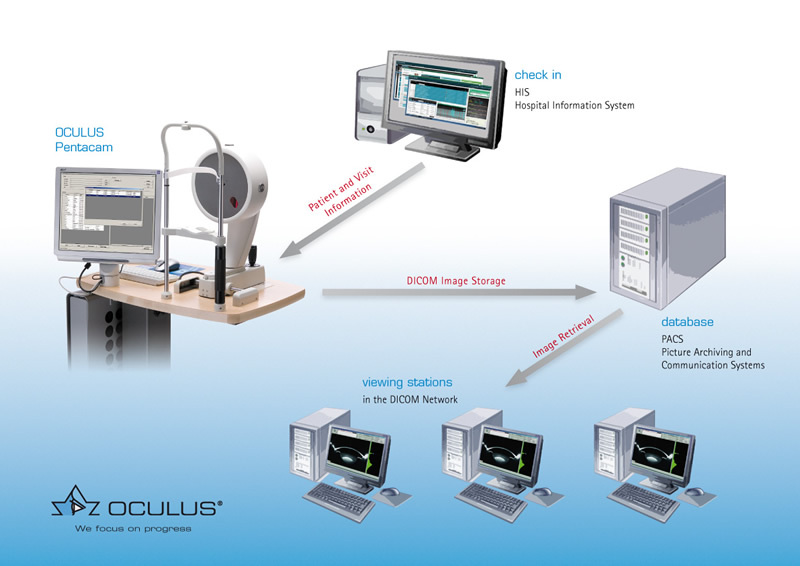 The Phaco Optics software developed by Prof. Thomas Olsen for the calculation of IOLs can be linked to the OCULUS Pentacam®. It automatically imports the anterior and posterior corneal curvature data from over 360 meridians calculated by the Pentacam® software. The software contains a huge and expandable database with IOLs from all major manufacturers. i-ASSORT performs both numerical and graphical astigmatic analyses of the corneal treatment using the Alpins Method. These are derived directly from the topography parameters measured by the Pentacam® unit. Other features include the calculation of corneo-refractive differences, ocular residual astigmatism (ORA) and the corneal irregularity quantified by topographic disparity (TD). BESSt II IOL Power Calculator was developed by Dr. Edmondo Borasio at Moorfields Eye Hospital in London. It allows IOL power calculation in patients who have undergone laser refractive surgery in the past. The specific advantage is that it does not require any pre-refractive surgery data. The latest Direct Import version allows the data to be automatically transferred from the Pentacam to BESSt II IOL Power Calculator. BESSt 2.0 formula is also available for iPhone/iPod Touch/iPad.